Depthsounder tracing for a Lophelia reef. Click image for larger view. South of Cape Lookout, NC (80 nautical miles south of The Point), a dramatic geological landslide feature, the "Cape Lookout Slide," marks the northward extension of the Blake Plateau. To the north, the continental slope is precipitous and highly sculpted, with narrow, interdigitating canyons and ridges. To the south, the shelf gradually gives way to the broad, current-scoured plateau that slopes gently seaward and extends hundreds of miles south to the Bahamas. Along the 450-m depth contour off southern North Carolina, a narrow band of hard southwest-northeast-tending ridges parallel the coastline. Breaking the monotony of the vast, desert-like sand plain of the Blake Plateau, these ridges provide the firm base upon which deep-sea corals long ago found a foothold. These are not the familiar colorful corals of shallow reefs, but very slow-growing stony corals adapted to life in dark, cold waters. They lack the light-dependent symbiotic algae that impart color to reef-building corals in tropical seas. Living branches are pure white, forming dense thickets on the reef surface. Underneath, dead branches accumulate in gray mounds several m deep and hundreds of m long. Radiocarbon dating indicates that such deep reefs, composed mainly of two coral genera, Lophelia and Enallopsammia, may be thousands of years old, with individual living coral bushes as much as 1,000 yrs old. Together, the ridges and reef mounds, which may rise as much as 150 m from the surrounding substrate, act to accelerate bottom currents -- a condition favorable to species that filter-feed on current-borne plankton. In this way, the growing reef alters the physics of the water column, creating an even more favorable regime for continued coral growth. The deep reefs south of Cape Lookout are the northernmost Lophelia reefs off the U.S. East Coast. First discovered by drop-cameras employed by the research vessel Eastward in the 1960s, Lophelia reefs were rediscovered by the U.S. Geological Survey in 1987 during side-scan sonar mapping of the continental slope. Preliminary submersible investigations on the Navy NR-1 in 1993 and the Johnson Sea-Link in 2000 revealed that several species of fishes and crabs are closely associated with this unique deep-reef habitat. 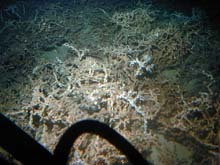 As an estimated 40,000 Lophelia reefs populate the Blake Plateau, this type of deep-reef habitat may be very important to many species in the western Atlantic. Indeed, some commercially exploited deep-water fishes, such as the wreckfish, may congregate around Lophelia habitat. Several types of crabs are abundant on the Cape Lookout deep reefs, perhaps providing important food resources for predatory fishes. Other invertebrates, including brittlestars, also populate the coral matrix in high numbers. On the otherwise barren and featureless plain of the Blake Plateau, Lophelia reefs form oases offering both shelter and food. Additionally, the coral-thicket habitats are surrounded by extensive coral rubble, which may also support a unique fauna of fishes and invertebrates. Rubble habitat may be formed as currents and boring organisms break down the fragile coral branches. This thicket of white Lophelia coral branches forms the top of a deep reef mound on the upper slope off Cape Lookout, North Carolina. Click image for larger view. Lying below conventional scuba depths, deep reefs of all types have been poorly studied in the world ocean. Submersibles offer a window into these little-known ecosystems. Shallow-reef ecosystems are under enormous fishing pressure, and subject to degradation due to a number of threats, including global warming. Deep reefs may provide an alternative habitat for deep-living groupers, wreckfish and other fish species, and perhaps serve as both refuges and replenishment areas. They also appear to form a zone of faunal merging, mixing species of typical coral reef faunal origin with elements of the deep-sea fauna. Lophelia reefs are widespread, occurring not only on the Blake Plateau and in the Straits of Florida, but also in the Gulf of Mexico, off Nova Scotia, in the northeastern Atlantic, and in parts of the Pacific Ocean. Their significance as fish habitat is unknown. No previous investigations have detailed the fish species associated with these reefs in any ocean. The mission objective for this segment of the Islands in the Stream/South Atlantic Bight Expedition is to conduct submersible investigations to gain fundamental knowledge of the fauna and habitats of Lophelia deep reefs off North Carolina. Preliminary dives have revealed a number of fish species not found in other shelf/slope habitats. Some of the fish and crab species living on Lophelia reefs may be new to science. We have only just begun the initial exploratory phase of research on these reefs. Open sand substrates surrounding coral habitats may include substantial large-grained carbonate particles, and thus, differ from open substrate in areas without reefs. Midwater fishes, such as hatchetfishes and lanternfishes, which are surprisingly abundant over and within the coral habitat, and may be important prey. No Lophelia reefs lie within established marine protected areas, but if such reefs prove to be important habitat, they may be candidates for protection. Like Oculina coral, Lophelia is fragile, slow-growing, and very vulnerable to physical destruction. Lophelia reefs along the upper slope lie in areas of potential cable-laying and oil/gas exploration activities. Lophelia reefs are found in deep water in all oceans. Deep-water reefs may harbor several as yet undescribed species of fishes and invertebrates. The Lophelia reefs of the North Carolina upper slope are the northernmost along the U.S. East Coast. Lophelia reefs can grow to over a mile in length and over 150 m high. Individual reef structures, also called banks or mounds, can be up to 40,000 yrs old.